Oakridge Centre has changed hands from Ivanhoe Cambridge to QuadReal Property Group and the new owners have plans to do a major redesign for a mixed-use development. QuadReal has selected Westbank as their partner for this redevelopment. "Along with QuadReal, we have an opportunity to bring to fruition a new standard of urban living about which we have long been passionate - a cultural hub that takes every element of a vibrant multicultural city and shares them with our community and millions of visitors a year," said Ian Gillespie, Founder of Westbank. "We believe the future of Oakridge Centre will be even more dynamic than its past. We have few opportunities in life to create world-class projects - this will be one." 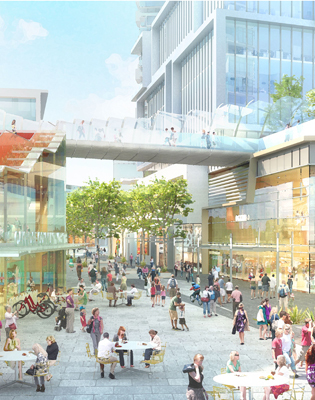 The new Oakridge Centre will be a true mixed-use community. As a prototype for inspiring city-making, it will be a culturally and environmentally sustainable model that harnesses the potential of a large urban site situated at a transit hub. The variety and diversity of retail will be increased to allow Oakridge to better serve new residents and the neighbourhood at large. A new outdoor shopping street, High Street, will bring about a different type of retail experience with cafés and restaurants spilling out onto the street which will enliven the community after the interior retail closes for the day. A consolidated amenity building with a seniors’ centre, a library, and multipurpose rooms will be adjacent to 9 acres of public open space. This expansive area will feature activity fields, urban agriculture, quiet gardens, a reflecting pool, sport courts, a running track, and more... a space for everybody to enjoy. The rezoning approved by the City of Vancouver in 2014. Estimated completion is 2025 as per Westbank and new redevelopment plans will be available to the public for review in the fall. More details here: Oakridge Redevelopment.